50 years ago this October, the first successful Satellite Laser Range measurements were taken, ushering in a new era in the science of measuring the Earth’s exact shape, center of gravity, and precise rotation. A panoramic view of the space geodesy systems at the Goddard Geophysical and Astronomical Observatory. Image courtesy: NASA GGAO. We like to think of Earth as a big blue marble; a shimmering, smooth sphere. In reality, our home planet is shaped more like a big blue potato (or, to be polite and more scientific, an “oblate spheroid”). The combination of Earth’s rotation at roughly 1,670 kilometers per hour, the uneven distribution of continents that are slowly moving, the Moon’s tug on tides, ocean circulation, and a host of other factors cause our planet to have an uneven surface that is a bit flat at the poles and slightly bulging around the middle. NASA’s 12 meter VLBI system detects radio signals from quasars in deep space. Image courtesy: NASA GGAO. This means that the Earth’s exact shape, center of gravity, and precise rotation are constantly changing and can only be determined through extremely precise measurements. An entire field of science called geodesy is devoted to taking these precise measurements, and NASA's Goddard Space Flight Center is at the leading edge of this field. In fact, it was in a field near Goddard 50 years ago this October that the first successful Satellite Laser Range (SLR) measurements were taken, ushering in a new era in the science of measuring the Earth. If you’ve ever used a GPS tracking device to navigate to a restaurant or used your smartphone to find your location in a city, you are using coordinates derived from geodetic measurements. However, while your phone can let you know where you are to within 1-2 meters, the techniques pioneered at Goddard and other research centers allow geodetic scientists to measure the relative position of a station on Earth to within a millimeter or less. If these precise measurements are made using objects outside the Earth, such as orbiting satellites, the Moon, or quasars in deep space, this is called space geodesy. For example, by bouncing a laser pulse off a retroreflector mounted on a satellite in a known orbit and accurately measuring the round-trip pulse time-of-flight, you can measure a station position relative to another station to within millimeters. With months or years of these measurements, it is possible to determine the direction and rate of station movement relative to other stations. And being able to determine if a station is rising, sinking, or moving in a certain direction – along with the rate of this movement – is important information for determining political boundaries, evaluating flood risk, forecasting environmental changes, planning future land use, and studying Earth processes. A DORIS antenna at the GGAO. Image courtesy: NASA GGAO. CDDIS is one of NASA's discipline-specific Distributed Active Archive Centers (DAACs) around the country that are repositories for storing one or more specific collections of Earth science data. The DAACs are part of the Earth Observing System Data and Information System (EOSDIS), which is a key core capability in NASA’s Earth Science Data Systems (ESDS) Program. The data collected through SLR and other geodetic techniques are one of the foundations of the EOSDIS, and NASA's Goddard Geophysical and Astronomical Observatory (GGAO) has been collecting SLR data continuously since the first successful SLR measurement was taken at the site (then called the Goddard Optical Research Facility, or GORF) on October 31, 1964. LAGEOS-1 and -2 (or Laser Geodynamics Satellites). NASA MSFC Image Exchange. 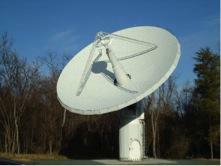 In fact, the GGAO is one of the few locations in the world that is home to all four space geodesy techniques – Satellite Laser Ranging (SLR), which also includes Lunar Laser Ranging (LLR); Global Navigation Satellite System (GNSS), which uses an array of satellites that transmit messages to ground receivers to determine the distance between the satellites and the ground stations; Very Long Baseline Interferometry (VLBI), which records radio signals from quasars, in synchronization with other VLBI stations, and sends them to a central correlator that measures the differences in signal arrival times to determine the positions of the participating stations; and Doppler Orbitography and Radiopositioning Integrated by Satellite (DORIS), a French system that measures the Doppler shift of signals transmitted from satellites in low-Earth orbit. Since 1964, more than 150 satellites have been tracked by a SLR network that today includes approximately 40 stations scattered around the world. Satellites tracked by SLR include NASA’s Gravity Recovery and Climate Experiment (GRACE), which measures variations in Earth’s gravity field - and Jason-2, which studies ocean surface topography. Two geodetic satellites specifically designed for precise station positioning by SLR (LAGEOS-1 and -2) currently orbit 6,000 km above the Earth. “Basically, [LAGEOS] looks like a huge golf ball with all these [retroreflector] cubes sitting in there. There are 426 cubes that you can bounce a laser beam off,” says Noll. A half-century after the first successful SLR measurements were taken at Goddard, SLR experts from around the world will gather in Annapolis, MD, October 27-31 to celebrate this milestone at the 19th International Workshop on Laser Ranging. The workshop, “Celebrating 50 Years of SLR: Remembering the Past and Planning for the Future,” will be held at the Historic Inns of Annapolis, and is sponsored by NASA, the Smithsonian Astrophysical Observatory, and the International Laser Ranging Service (ILRS). GSFC is the focal point of this workshop not only because of its significance in the history of SLR and space geodesy, but also because it is the home of the CDDIS and the headquarters of the ILRS Central Bureau. The CDDIS at Goddard has been one of two international archives for worldwide laser ranging measurements for more than 30 years. The archive is about 8 TB in size and one of the most heavily used of the NASA DAACs. Between October 2013 (the start of the fiscal year) and July 2014, the CDDIS distributed more than 60 TB of data and more than 120 million files to over 143,000 users, according to the EOSDIS. In the month of June alone, the CDDIS distributed more than 10 TB worth of data and almost 12 million files to an average of 2,000 unique daily users. More than 65% of these data are distributed to foreign users. The high use of CDDIS data is thanks to not only the success of the EOSDIS data systems that provide free access and secure storage for these data, but also the work of the EOSDIS to adapt these data systems to the needs of the laser ranging community. Many members of this community will be traveling to Goddard this fall. The GGAO SLR system in operation. The green beam is the laser. Image courtesy: NASA GGAO. Since 1964, the ruby laser used in the first SLR measurements has been replaced with a green beam based on frequency-doubled Neodymium Yttrium Aluminum Garnet lasers, and the 210-acre GGAO facility now houses almost a dozen individual instruments for conducting geodetic measurements, including three SLR systems. Of course, the facility has changed in other ways as well. Based on 20 years of GNSS data from Greenbelt, MD, the station has moved roughly 8 cm north and 30 cm west, and the station’s elevation is approximately 2 cm lower. Celebrating the science behind this knowledge and planning for the future of laser ranging will help keep Goddard at the center of this science. For more information about the 19th International Workshop on Laser Ranging and a tentative agenda, go to the workshop website at http://ilrs.gsfc.nasa.gov/ilrw19/index.html.